Let’s face it: selecting just the right present can sometimes feel like a daunting task. The difficulty of choosing increases when you’re searching for something for someone who seems to have it all! That’s where personalised Christmas gifts for her come in. Whether you’re looking for something sophisticated, chic, or trendy, you’ll love the hundreds of options you’ll find here. 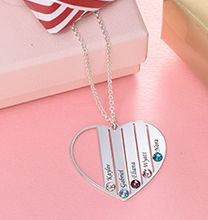 Celebrate your lasting love by presenting her with a couples birthstone necklace that includes your birthstone and hers. 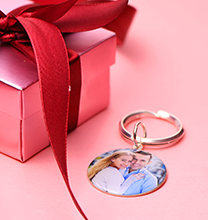 This unique design features two hearts intertwined, with your names engraved on either side. Not just for Valentine’s day, this necklace is both beautiful and meaningful! While the next of our personalised Christmas gifts for her is less obviously romantic than some of our other options, it is both classic and on-trend. The celebrity initial necklace can be paired with any outfit, and you can choose from a classic initial pattern or create a monogram that has special meaning to both of you. What’s hot right now, and will never lose its appeal? 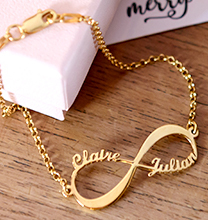 The infinity name necklace comes with up to two names, or two inspirational or sentimental words of your choice. Graceful loops and beautiful script complement the simple design, which is one that’s ideal for any woman who means the world to you. 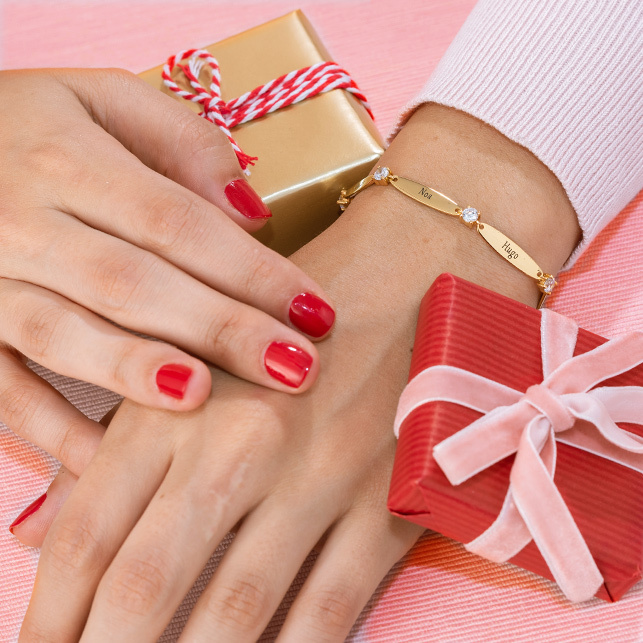 If you’re shopping for someone such as a sister or best friend, romance may not be the first thing that comes to mind! 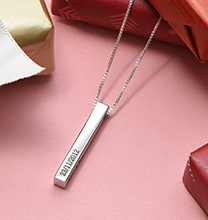 A cursive name necklace makes a classic gift for any teen or woman on your list. These fashionable necklaces have been popular for years, perhaps because they are so unique. Not into names? Pick any word that’s meaningful to her and have it made into a necklace…she’s sure to love it! What would this list of personalised Christmas gifts for her be without a mention of mothers, grandmothers, and special in-laws? The holidays are the perfect time to celebrate these beautiful relationships with Christmas jewellery for Mum. Sparkling birthstone charms, filigree family trees, and family love circles are just a few of our favorites. While you’re searching for the perfect Christmas gift for mum, be sure to take a peek at our Mother Rings collection. 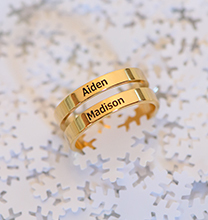 Not just for Mother’s Day, these rings come in a variety of configurations, ranging from ultra-trendy stackable birthstone rings to traditional birthstone rings to celebrate all her children. If mum loves the look of family tree jewellery, consider the gift of a Family Tree birthstone ring. Interlocking hearts, infinity rings, and gorgeous double infinity rings are some other styles that are certain to set Mom’s heart aflutter this Christmas! Floating lockets, engraved bar necklaces, and monogrammed bracelets and rings are among the most popular options when it comes to giving trendy jewellery gifts for Christmas. Better than housewares or yet another pair of slippers, these thoughtful personalised gifts for her are sure to be among the most unique presents she receives!